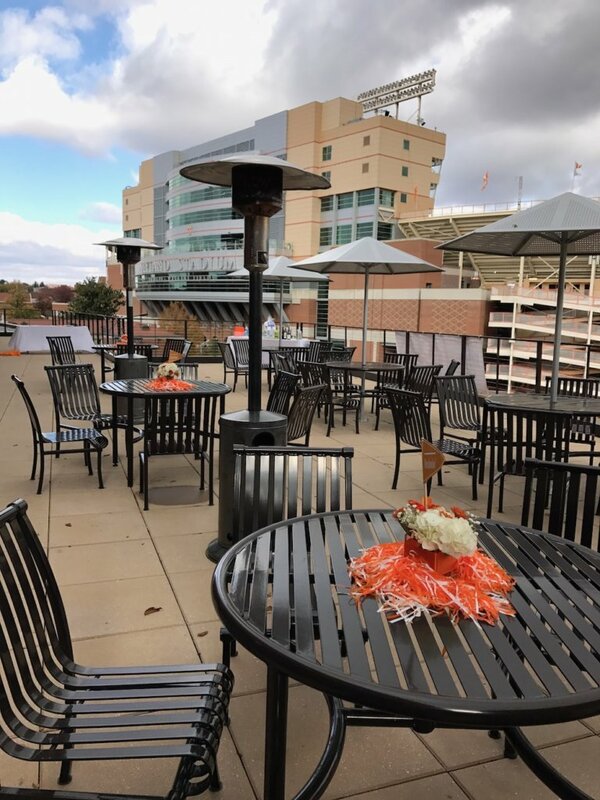 The University of Tennessee campus has a newly available event space that is ideal for fall football tailgates or receptions year-round. 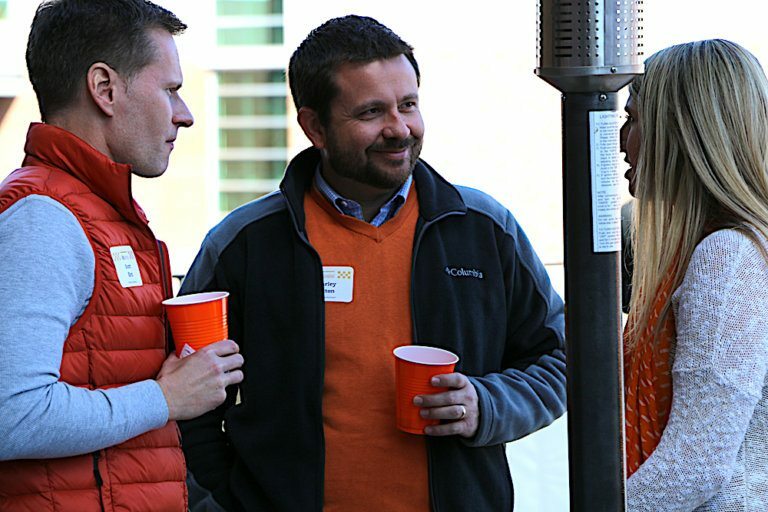 “The Patio,” which is attached to the UT College of Communication & Information (CCI), is the perfect location for a tailgate before a Vol football game with views of Neyland Stadium and the Tennessee River. It also offers a short walk to the gates for ticketholders. “It all comes down to the view,” said Patrick Powell, who was the director of development for CCI and now is headed to Atlanta to serve the UT Foundation as chief development officer for the region. “It is the best view in the most high-traffic area on campus. Michael Wirth, dean of the College of Communication & Information, said the venue offers 3,000 square feet of outdoor space and the indoor lobby of the CCI building with a capacity of about 200 people. If extra space is needed, attendees also could have access to the on-site Scripps Lab. While “The Patio” is ideal for tailgates – the availability of private restrooms is a selling point in itself – the venue also can be used for an assortment of other events, including receptions, luncheons and dinners. The lobby access and overhang on the patio also ensure a protected space for inclement weather. 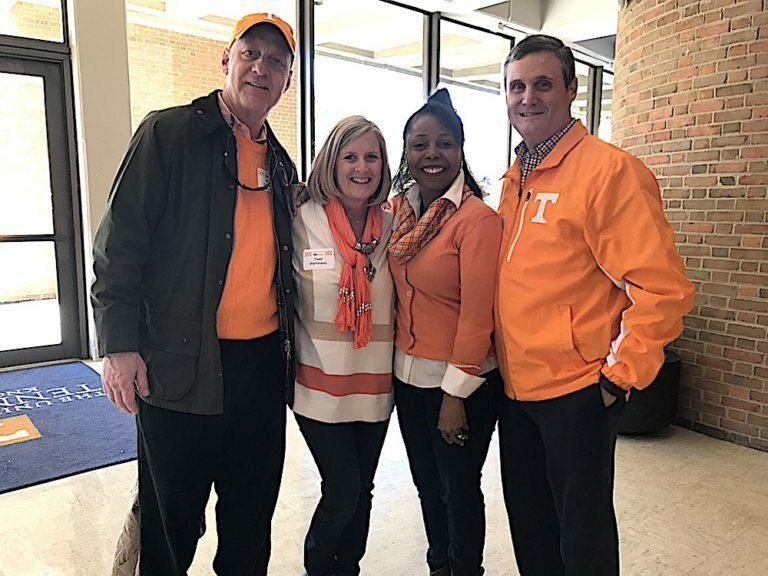 Moxley Carmichael hosted a tailgate at “The Patio” for the Tennessee vs. Missouri game, and Cynthia Moxley’s Blue Streak has coverage and photos. Access to the space, which originally had a wooden deck with no railing, was closed off for 40 years. It consisted of black railing and a lot of boulders and rocky terrain when Wirth arrived in 2006. He remained intrigued by the space and when an opportunity finally arose to renovate it, Wirth knew he had a new gem at the CCI building. “The Patio” officially opened Nov. 11, 2015, and included a repaired roof, compliance with all building regulations and an additional exit to meet fire codes. The computer lab was moved to allow the second exit off the patio, and the digital learning space for students was expanded. With its sweeping views and easy access to the stadium, Wirth decided “The Patio” could become a go-to event space, especially for football parties. Interest already has been expressed for the Tennessee vs. LSU football game next season. The pricing details still are being determined, with a likely range of $2,500 to $5,000, depending on the opponent. Pricing also will be set for events, such as receptions, luncheons and dinner. The chancellor’s office will grant approvals for beer and wine on a case-by-case basis. Parking can be arranged – depending on time of day – at nearby lots or around Circle Park when available. Wirth noted use of the event space can’t disrupt class schedules, but there is flexibility with scheduling the space, especially on evenings, weekends and in the summer. Wirth recommended anyone interested in holding an event should request a tour to see the full space of the lobby and patio and the possibilities for food setup and décor. Inquiries should be directed to the dean’s office and administrative specialist Beth Cole at 865-974-1540. Maria Cornelius, a writer/editor for Moxley Carmichael, populates the EventCheck Knox calendar. The author of “The Final Season: The Perseverance of Pat Summitt,” Maria is enjoying college basketball season and waiting for pitchers and catchers to report.